Heide, from Germany, was one of my first customers, and bought from me for many years. 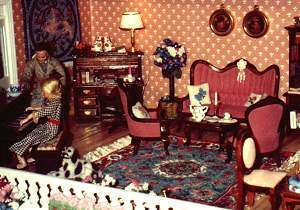 She was a prolific stitcher, and owned several beautiful doll’s houses. I first met Heide at the Alexandra Palace Doll’s House Fair, around 1998. She told me about the designs of mine that she had stitched, and said that she felt that they were ‘her babies’. I laughed, and told her, ‘No, they’re all *my* babies, as I designed them!’ So, after that, we had a long-running joke that we *both* owned all the babies! Sadly, Heide died in 2016, but with her partner Karl-Heinz’s permission, I would like to keep this page up as a tribute to her and her enthusiasm for the miniatures hobby. Heide wrote: A friend of my father’s handcrafted furniture for a kitchen, a dining room and a bedroom 1949. 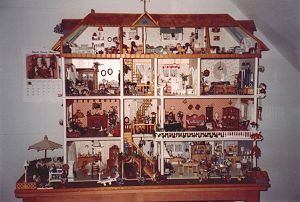 But there never existed a dollshouse until my son aged 8 wished to have a dollshouse for his Playmobil-family. We bought a readymade “Lundby” and put the old furniture and a lot of new things in it. After my son finished playing I took over the little house. Shopping in England, USA and the Continent made it necessary to enlarge the house, but after & few years it was totally overfilled. 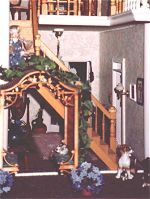 So in 1996 my husband started his first year as a retired with building a large house and 10 months later the dollshouse-family moved. Since that time I have been keeping on collecting miniatures and sewing and stitching and “sculping”. The Bokhara, (“Rebecca”), is in the Hall (ground floor) and can hardly be seen. The Chinese (“Patricia“) is in the smoke-room, where the Landlord and his brother in law are playing cards (each of them with one Joker.’). 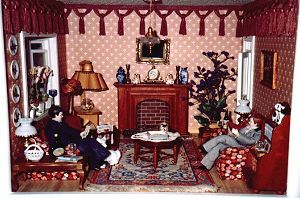 There are some things in the room to symbolize the civilized standard of the dollshouse family: Staffordshire dogs, antique glassware and china and a large Chinese carpet. All in all a room of leisure for nice hours by the fireside. 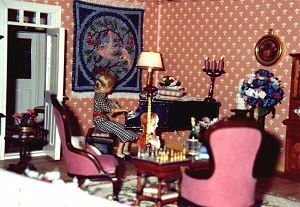 The Circular Scene (“Victoria“) is used as a wallhanging in the big saloon, where the housewife’s sister is “treating” the Steinway with Chopin, and she does it now for many years! The doll is a German CACO-doll, made in the early 40’s. The piano is an antique one too, made in the beginning of this century, priced DM 1,25, today about 38p !!! The William Morris (“Carole, pastel“) is in the master bedroom, furniture from 1949 (see above); sewings as bed, curtains and dresses made by me, as well as the hats. The boxes on top of the cupboard are typical for that time. 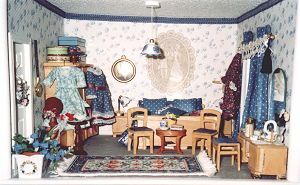 As you can see, my dollshouse is typical German. It’s self-designed and self-built, even the little dog’s house. When there is more time and space for us we’ll build another house with shops to put all my designed dresses in. Hoping to have given some useful information to you I send you my best regards. Heide. Thanks, Heide! These last pictures show how she used her own ideas for the colourways for some of the designs. In 2010, Heide donated one of her houses, the Big House, to a museum of childhood – but first she took out some of the carpets, and put them into her second house, The Café! But The Café will follow the Big House to the museum in 2014, so she says that again she will take out most of the carpets to put them into her third project, The B&B. In her words, “Double shame on me!! !” for not letting her carpets go with the house. “I thought my age of 70 would make me a wise and unselfish woman, but there are obviously a lot of things I would miss.” I think that is perfectly understandable! R ecently, she has been working on a huge paisley carpet, based on a very early design of mine called “Phyllis”, which appeared in my book ‘Miniature Needlepoint Carpets’, but is no longer available as a kit. 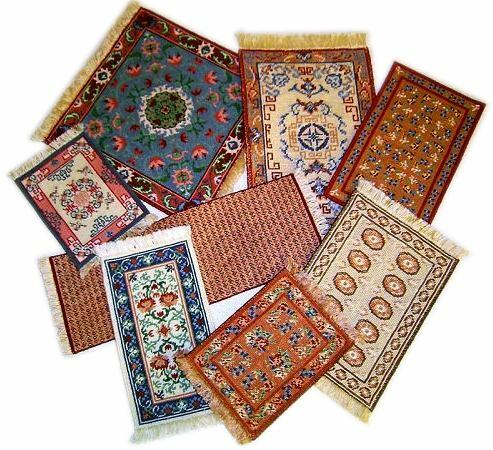 The carpet measures 13 by 4 1/2 inches (32 by 11 cm) – large by anyone’s standards! It will fit one of the three lobbies in her B&B, which is in the process of being made. This group photo shows many of the carpets that Heide has stitched over the years. She alters some of the colourways to suit her houses, and some she stitches as per the kit. It’s easy to see, from this photo, that Heide has a ‘favourite palette’ for her stitching! Clockwise from the top left, these carpets are: Elizabeth, Patricia, (then a carpet that is not one of my designs), Rebecca, Jessica, Carole pastel, Heide’s design based on Phyllis, and Ruth.